HOLE IN ONE: Why the Krispy Kreme store on 23rd Street in Chelsea is now closed, we’ll never know (especially since the company refuses to answer our weepy emails). 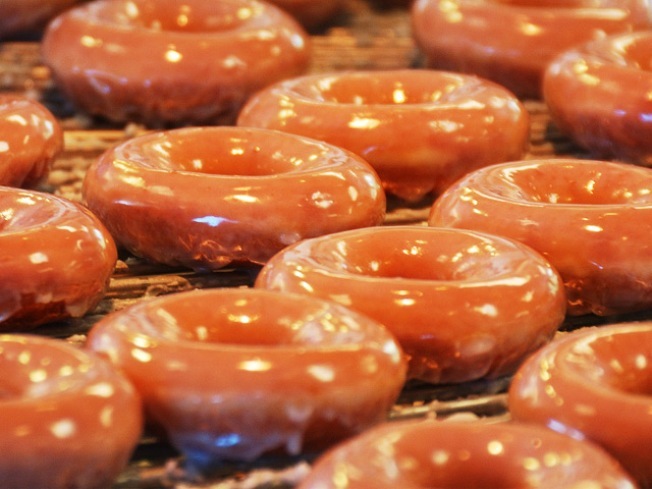 We DO know that today is National Doughnut Day, and that means free Krispy Kremes for all! (One per customer, no purchase necessary.) Dunkin Donuts’ is also giving away the fried stuff, but, really--why would you want to do that? Visit the Krispy Kreme at Penn Station until 9PM. FUNDERGROUND: If your biggest regret about being an adult—other than taxes and high blood pressure—is the sheer lack of playing games for the fun of it, the Come Out & Play Festival has your inner child’s number. Kicking off Friday night, the fest runs all weekend, organizing/hosting more than 30 games, activities or other fun, utterly ambition-free pastimes. Parachutes! Life-sized mazes! Something called the First Annual Paper Airplane Derby! The Opening Party is at Park Slope’s Brooklyn Lyceum at 7PM. BEAUTIFUL DAY: Running through June 12, engagingly retro-flavored singer-songwriter Nellie McKay settles into a residency at Feinstein’s at Loews Regency, playing tunes from her latest release, an album of Doris Day covers (don’t gape, this stuff is genius) called “Normal as Blueberry Pie.” 8:30PM.